Taking into account the growing interest in South African Pinot Noir and the awesome increase in visitor numbers to one of South Africa’s most beautiful wine regions, the Hemel-en-Aarde, it is not surprising to see Pinot Noir from this region taking flight around the globe. This year’s theme for the prestigious annual Pinot celebration is aptly ‘On the Wings of Pinot Noir’. A true reflection of the quality Pinot Noir wines produced in this cool-climate South African wine region. The cool-climate Hemel-en-Aarde is world renowned for Pinot Noir of great purity and finesse and every year the producers join forces to celebrate their passion for this highly revered cultivar. This year exciting vineyard safaris, delectable pairings and cuisine from celebrity chefs will be the order of the day. A new addition to the programme is a very cool wine auction. All in all, 2019’s festivities promise to set your senses soaring – a must for all Pinot lovers! This year South African wine legend Jan ‘Boland’ Coetzee and wine fundi Roland Peens will be the guest speakers. Wine impresario and Burgundy aficionado Remington Norman will open the formal tasting on Saturday, titled ‘Taking Flight’. This is guaranteed to give more insight into the wonderful world of Pinot Noir. The winemakers will have the opportunity to present their own wines which will no doubt elicit lively discussion. This tasting promises to be an interactive experience with the winemakers presenting their wines, moderated by Roland Peens, and will no doubt elicit lively discussion. Participating Hemel-en-Aarde wineries include Ataraxia, Bosman Family Vineyards, Bouchard Finlayson, Creation, Domaine des Dieux, Hamilton Russell Vineyards, La Vierge, Newton Johnson, Restless River, Storm Wines, Sumaridge and Whalehaven. 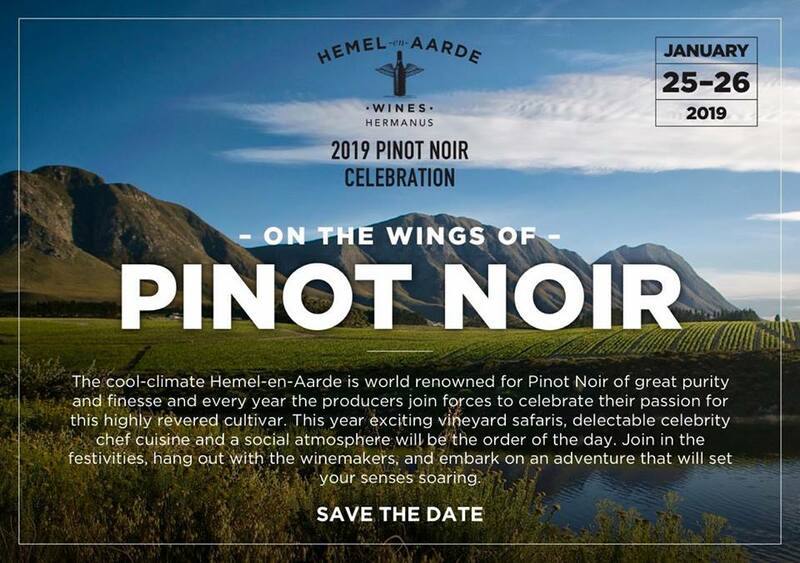 To sum up, the Hemel-en-Aarde Pinot Noir Celebration is a two-day event which has become famous around the world with lovers of Pinot Noir and local South African cuisine. During the weekend renowned winemakers, famous chefs, esteemed media and wine lovers will gather in the Hemel-en-Aarde outside Hermanus – exploring Pinot Noir, enjoying unforgettable food and learning of and celebrating the exceptional wine, food and people of the Hemel-en-Aarde wine region. Only 140 full weekend tickets are available. Meet and taste with the winemakers at their barrels. Join an exclusive auction with unique Hemel-en-Aarde lots. Domaine De Montille – a Phoenix risen! Domaine de Montille is not only one of the greatest domaines in Burgundy, but one of the greatest in France. Based in Volnay, it wasn’t until Hubert de Montille took over in 1947 that the estate started its decades-long path back to glory. In an era when 90 percent of the region’s crop was being sold off to négociants, Hubert took a stand against the commercially styled wines that were in vogue to make terroir-driven wines instead. Hubert’s son, Étienne, took control of the cellars in 1990, and by 1995 the de Montilles started the slow conversion of the estate to organic farming—a choice which took their old-school “terroirisme” to a whole new level. 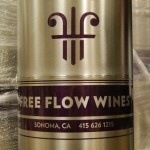 In 2005, they began implementing biodynamic principles, and in 2012, they earned their official organic certification. Domaine de Montille makes some of Burgundy’s most exquisite wines. Elegant, understated gems which possess haunting perfume and impressive length of flavour. Kevin and Burgundy expert and Pinot-phile, Derek Kilpin, will co-present a sensational tasting of hand-picked Pinot noirs from this Pearl of Burgundy. Setting the stage with a Bourgogne Rouge then going on to entrance our palates with 5 Premier Crus, before finishing with a majestic Grand Cru, this tasting is guaranteed to romance and seduce as only the King of Grapes can. North meets South … discovering and celebrating Pinot Noir! Winemaking team Corlea Fourie and Natasha Williams will take you on a comparative tasting experience across four continents moderated by Angela Jordaan. Discovering and celebrating Pinot Noirs produced in New Zealand, USA, France and South Africa. The tasting will comprise three flights of three wines in each flight. Light snacks and refreshments will be served on the veranda of the Framehouse with breathtaking views of Bosman Hermanus’ Vine Garden at the foot of the majestic Babylonstoren Mountain. Bosman Hermanus’ Estate takes pride of place in the Upper Hemel-en-Aarde Valley where our vineyards are planted between indigenous fynbos fields in close proximity to the ocean. Here ideal soil types combined with the cooling breezes from the Atlantic Ocean create winegrowing conditions rivalling the world’s best. As a young wine producing area some interesting and extraordinary wines are being made. We look forward to seeing the results of this exciting venture and how the wines will evolve as the vines mature. Whalehaven is proud to collaborate with specialist French fine wine importer Premier Cru to bring you a Promenade through Burgundy through the wines of Domaines Albert Bichot – leading Burgundy wine house established in 1831. We learn a bit more about this historic wine trading family, the leading buyer at the annual Hospices de Beaune charity auction for over fifteen years. The family own vineyards from Chablis to the Beaujolais and a lot of emphasis is placed on organic viticulture. We are privileged to taste a selection of wines from their estates located in Nuits-Saint-Georges, Pommard, Mercurey, and Moulin-a-Vent as we try to understand the Albert Bichot spirit. We return from our Promenade to the pristine Hemel en Aarde region where we conclude the tasting with a vertical of Whalehaven’s flagship Conservation Coast range – first produced in 2012. Whalehaven makes an effort to differentiate itself by keeping a limited amount of older vintages of these wines for appreciative trade and private customers. We compare these vintages to fresher vintages with winemaker Reino Thiart and discuss the optimal drinking time for these wines, especially in the context of food pairing. With the help of acclaimed head chef Calum Anderson from the Bottega family’s restaurant at sister property Idiom, we bring some of the pairing ideas to life for the few lucky participants who sign up for this special France meets South Africa tasting. Winemaker Chris Albrecht will take you on an international comparative Pinot Noir journey from various sought after wine locations in the New World to the heart of Red Burgundy in the Côte de Nuits. Two flights of five wines each – including three New World examples and two Red Burgundies per flight. Followed by a deliciously tasty light lunch in the magic of our Homestead cellar prepared by Chef Stefan Otto. Limited to 18 pax. Presented by Creation Pinot Noir artists, JC Martin and Gerhard Smith, you can look forward to sharing in the enchantment of the award-winning Creation Pinot Noir portfolio along with beguiling Pinots from Europe and New Zealand. To add to the many-facetted pleasures, the tasting will be enhanced by delectable canapés, lovingly composed by the gifted Creation Culinary Team. Set against the scenic backdrop of Hemel-en-Aarde Ridge, this unique event promises to be pure Pinot poetry! This year we’ve invited three of SA’s top sommeliers to join us in a tutored tasting, led by them, as we journey through their findings. Their task: raid some of SA’s most opulent and well-stocked cellars to find Pinot Noirs that excite them. The result, some incredible, show stopper, bucket list international Pinot Noirs that you will wish lived in your cellar. A tasting to compare and then discuss the style of Grand Cru Burgundy against the styles of benchmark wines from Oregon and New Zealand. Two producers’ wines will be shown from each country. Several canapés will be served before and during the tasting; prepared in-house to match the wines by cookbook author Olive Hamilton Russell. 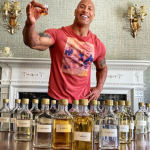 The tasting will be at Braemar House, the private home of Anthony and Olive Hamilton Russell on Hamilton Russell Vineyards. For those who believe in the concept of terroir, it is the unique elements of the site which impart to the final product (wine, cheese, even ham) its unique flavour and character. Burgundy is the heartland of the terroirist’s vision. 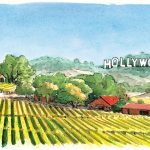 No other place on earth offers such clearly defined nuances: the same grower, using identical viticultural practices and working adjacent appellations, will produce discernibly different wines. The explanation for this does not lie simply in the aspect of the region’s gentle hills, with vineyards running in tight rows between villages, or in the soils – though some are clearly more suited to Chardonnay than they are to Pinot Noir. The most recognisable differences relate in some way to the gentle curves of the landscape tracking the north‐south line of the côte. Michael Fridjhon, for whom Burgundy provided the inspiration for his life in wine, will walk us through a tasting which illustrates the primary differences as you progress from Santenay in the south of the Côte d’Or to Gevrey in the north, on the way making a detour to place the Hemel‐en‐Aarde in this wider vinous landscape. Take a journey through some of Gordy and Nadia’s most admired Pinot Noirs from around the world. Yes, great Burgundy is an easy one, and there will be a couple of those, but which other wines have impressed them over the years? What makes these wines tick and are these producers still on the right track? If Burgundy is the barometer for Pinot euphoria, which other wines are guided by the same philosophy? Much of the New World has followed a fruit forward and ‘bigger is better’ approach when it comes Pinot Noir, so we get to find out if our choices are still guided by the virtues of complexity, purity and the notion of terroir. A younger breed of micro-negotiant is making waves in Burgundy, creating thrilling wines from famous, and some not-so-famous vineyards along the Cote d’Or. We will taste pinots from these sites and discover the new and exciting vignerons behind the wines. A comparative blind tasting for the Pinot Noir connoisseur. True expressions from around the world will be showcased during this compelling and fun event. Guests will have time to taste, compare and interact informally. Further discussions will follow without a doubt and will likely carry on for the remaining part of the Celebration. In the end that is what wine is all about and even better when experienced amongst friends! Canapés will be served after the tasting. While celebrating Pinot Noir over the weekend, Sumaridge will be offering a unique opportunity to taste Hungarian Pinot Noir with our winemaker Walter Pretorius on Saturday 26 January 2019. Three Pinot Noirs from different regions in Hungary have been selected and the wines will be presented in an educational fashion to give our guests some perspective on how the wines and terroir differ between Hungary and the Hemel-en-Aarde Valley. 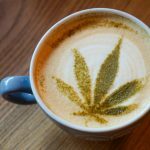 Don’t worry – it will be fun!! Each one of the three wines will be accompanied by an Eastern European tapa-style dish prepared by Sumaridge chef and brother of the winemaker, Cobus Pretorius. The tasting will be held in our Barrel Sanctum to create a memorable wine tasting experience.